Prior to her arrest, Vanny had been regularly taking part in the so-called Black Monday protests, a campaign former to call for the release of several human rights workers and an election official jailed on corruption-related charges. The Court of Appeals last week upheld a verdict against prominent housing rights activist Tep Vanny after she was sentenced in September along with three fellow activists for taking part in a protest in 2011. Kong Chantha, Bo Chorvy and Heng Mom, also Boeung Kak community activists, were also found guilty, however, they were granted bail. “My family and I as well as villagers and civil organizations hope that [Prime Minister] Hun Sen will ask the king for royal amnesty, which would provide justice for me and free me from prison,” she said. Bov Sophear, another Boeung Kak activist, last week maintained Vanny was innocent of the crimes she was charged with, saying the court served private interests, in an apparent reference to the ruling Cambodian People’s Party. Touch Tharith, an Appeals Court spokesman, said that the court had found that Vanny could take her appeal to the Supreme Court if she wanted to pursue the matter further. 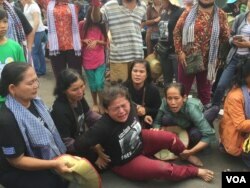 The international community, including the United States and European Union, have voiced concerns over the prosecution of government critics and human rights workers in recent months, which they described as part of a general rolling back on democracy in Cambodia.